The cows and horses would have come for the last blades of grass. Now their bones are scattered on the cracked earth, victims of drought that wiped Santiago's weekend playground Lake Aculeo from the map. Lake Aculeo's demise is so sudden and complete it seems as if someone had pulled a giant plug and let all the water out. So sudden was it that as recently as 2011 the 4.6 square-mile (12 square-kilometer) lagoon was a thriving weekend getaway for people from the Chilean capital an hour away. Thousands came here to swim, water-ski, sail or simply cool off in the long austral summer. They camped along its shores and lined up for tables at busy lakeside restaurants. Now, water and cooling summers on Lake Aculeo are a fast receding memory. 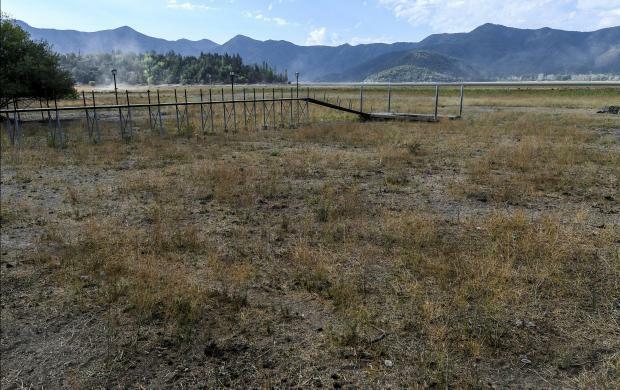 "We have been suffering drought for 10 years, and now the lake has disappeared, with tourism, camping, business, everything," laments Marcos Contreras, a campsite employee. Wooden jetties now poke out grotesquely over the flat plain of the lakebed. Canoes and speedboats gather dust on the former lakeshore. A giant sign on the approach shows the lake as it was -- stark blue against the backdrop of the towering Andes -- saying "Help us to protect the lagoon." Once boasting a depth of 20 feet (six meters) the water level began to fall from 2011. By last May, the lake had dried out completely. There's no single explanation, though climate change is a key factor. Locals and experts point to a drastic decrease in rainfall. But agricultural practices requiring vast amounts of water and lakeside development are also factors. "My grandparents remember when torrential rains fell for a minimum of a week, and today, if it's raining for two days, we're lucky," said Camila Nunez, 20, who works in a nearby restaurant. Average annual rainfall in central Chile during the 1980s was nearly 14 inches (350 millimeters). By 2018, that had fallen by half. Scientists predict it will continue to fall because of global warming. "We are living through a very prolonged period of drought that has lasted several years," said Eduardo Bustos, director of climate change research at the Catholic University of Chile. "In the future, we see that there is a tendency for rainfall to decrease, so it is very likely that the next few years will be as dry as those we have experienced." Around 70 percent of Chile's population live in drought-prone areas where rainfall has decreased significantly. Experts estimate temperatures will continue to rise until 2030 and water levels inland will drop by as much as 30 percent. 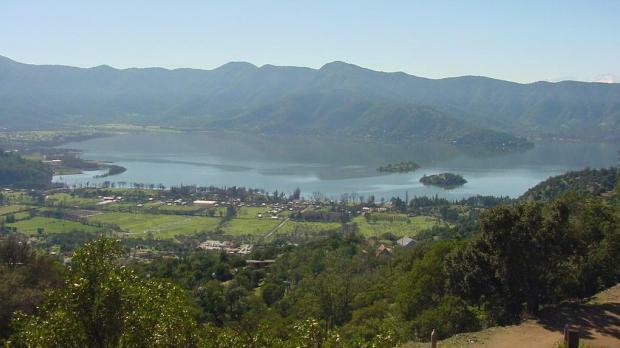 But other factors have contributed to the ecological disaster at Lake Aculeo. A viable lake meant booming tourism. It proved a magnet for developers. Second homes and shops mushroomed, hiking up domestic water demand in a short time. Farming put added pressure on the ecosystem which led to over-exploitation of the lake for irrigation purposes, particularly for the lucrative avocado crop. "The need for water by crops in the adjacent agricultural area generated pressure on the lagoon" until it was empty, said Bustos. What's left behind is a dusty landscape of crusty earth and spindly, dried shrubs. And summer memories for people like Antonia Romero. The 26-year-old who grew up on its shores and is now employed at one of the few functioning campsites, left to reflect on its demise: "We were killing the lake little by little."